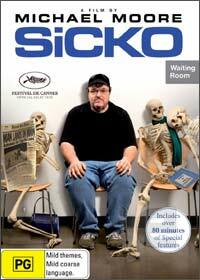 Sicko is the latest "shock" documentary from Michael Moore (Bowling for Columbine) who once again challenges the American establishment with this current topic revolving around the failure of the American health system. Moore's "shock" documentary approach uses a combination of personal stories, fact, fiction and anecdotes to give the viewer a true insight, although biased opinion of this crumbling system. Although there are a fair number of people into the United States who have access to health insurance, the companies use a plethora of tactics to prevent payment such nitpicking the client's policies for inconsistencies, only paying for certain aspects of the medical treatment or various other nefarious tactics that will leave you shocked. Some of the stories are quite depressing such as clients who have been diagnosed with cancer that have the insurance company stating that these clients do not have cancer or a lady who believed that she was covered but when investigators found she had a yeast infection, her policy was cancelled and she was forced to pay for her treatment. The documentary delivers an ultimatum to Americans, you're damned if you do and you're damned if you don't, without insurance you are forced to pay astronomical medical costs, whereas if you have insurance, you are left guessing as to whether all your expenses, partial expenses or no expenses at all will be paid by these international conglomerate insurance companies. In conclusion, Moore paints a bleak picture of the American health system and the documentary is quite one sided as Moore is not all about social justice but rather about his forceful approach to documentaries which is starting to wear a little thin. Definitely a DVD for those that love Moore.